In 1947, Talbott’s Christmas Tree Farm began one mile north of Manito when Earl Talbott planted pine trees as a conservation measure on barren, sandy soil owned by his father, Glen. The sandy soil was ideal for growing Scotch pine trees but not much else. When Earl’s brother, Bob, returned from the Navy, the brothers began to cultivate the trees into Christmas trees with help from their cousin, Lacey Talbott. The brothers sold their first trees in 1954 for 65 cents each at Talbott’s Christmas Tree Grove outside of Manito. To increase sales, they sold centerpieces made by their wives, Dorla and Dot, and pine trees that had been flocked by Bob. 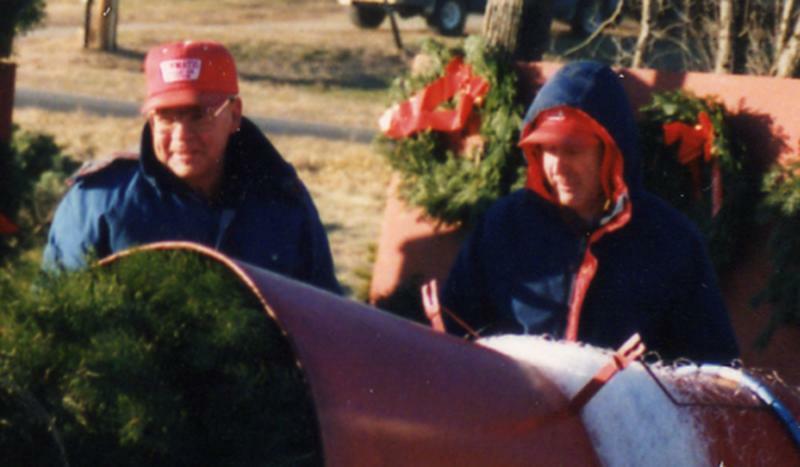 Over the years, Bob and Earl put additional acres into Christmas tree production on the Manito blacktop and near Green Valley. In 1964, the cut-your-own tree sales were moved to the present location, six miles south of Pekin on Route 29 and the Manito grove was closed to the public. Bob’s daughter and her husband, Susan and Brian Frank, began assisting with the Christmas tree operation in 1977. In 1988, Earl retired from the tree business and sold his share of the tree farm to Brian and Susan. A few years later, Susan and Brian purchased the remaining half of the business from Bob and Dot Talbott. Thirty to forty seasonal employees are hired each year to help with planting, shearing, wreath-making and sales. These include high school and college students, local farmers and friends. A local farmer, Scott Friedrich, has been involved with the tree operation since he was 16. Bob and Dot and Brian and Susan's children continue to help during the busy season. Talbott’s Tree Farm -- a central Illinois' tradition for over 60 years. Copyright Talbott's Christmas Tree Farm. All rights reserved.